Perth’s commanding officer, Captain Hector Waller, had witnessed the Dutch cruiser De Ruyter go down and assumed Rear Admiral Doorman to be dead. As senior officer he ordered Perth and Houston to set a course for Tanjong Priok near Batavia (Jakarta), 360 nautical miles to the west.The sole Allied survivors of the Battle of the Java Sea, HMAS Perth and USS Houston, retreated under cover of darkness and escaped destruction. … What an infernal night, and how lucky we are to escape. It seems almost miraculous when the sun comes up on the next morning, February 28, for there have been many times during the past fifteen hours when I would have sworn we would never see it. The Houston was a wreck. Concussions from the eight-inch guns had played merry hell with the ship’s interior. Every desk on the ship had its drawers torn out and the contents spewn over the deck. In lockers, clothes were torn from their hangers and pitched in muddled heaps. Pictures, radios, books, and everything of a like nature were jolted from their normal places and dashed on the deck. Early in the morning of February 28, 1942 the battered cruisers reached Tanjong Priok and almost immediately Vice Admiral Helfrich ordered them to make for Tjilatjap at Java’s south coast. After yesterday’s battle both cruisers were low on fuel and short of ammunition, especially 8 inch ‘bricks’. This was a serious problem as the port installations and bunker facilities had been the target for repeated Japanese airstrikes during the past weeks. At 1700 both cruisers departed, half refueled, short of ammunition and unescorted. Captain Waller had decided not wait for the Dutch destroyer Evertsen, whose departure had been delayed. Once clear of the port Waller ordered a straight, high speed run for the Sunda Strait, despite serious warnings about a Japanese fleet. Luck was against them that night. Around 2300, when the cruisers were altering course to the south-west to enter the dangerous Sunda Strait, they were spotted by the Fubuki, one of Admiral Kezaburo Hara’s Japanese picket destroyers. Unintentionally they had run into a fleet of five cruisers and 12 destroyers, screening the 58 troopships that carried General Hitoshi Imamura’s 16th Army. A ferocious gun battle erupted in the tropical darkness. Illuminated by destroyer searchlights the Allied cruisers were overwhelmed by a hailstorm of Japanese shells and torpedo’s. Countless direct hits turned HMAS Perth into a flaming wreck and the crippled cruiser sank around midnight. All Japanese ships were now free to concentrate their firepower on the USS Houston and shells of all calibers rained down on the doomed vessel. A full broadside of Japanese 12 inch shells wiped out her rear engine room and killed all hands in the engineering spaces. A direct hit by another 12 inch shell shredded one of her main turrets and started a violent fire in the ammunition handling rooms. 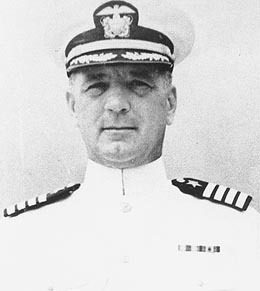 Captain Al Rooks had no choice but to flood the magazines, putting USS Houston’s main armament out of action. The end came when the unlucky Houston was almost simultaneously hit by three Japanese type 93 torpedoes. The fiercely burning cruiser developed a heavy list to starboard and Rooks ordered his exhausted crew to abandon ship. The surviving crew launched the remaining life rafts under a hail of Japanese 8 inch shells. One of these blew up a .50 cal machine gun mount and a lethal hailstorm of razor sharp steel fragments raked the crowded decks and ripped Al Rooks chest apart. He died a few seconds later in the arms of his executive officer. The tormented Houston slipped burning beneath the waves on Sunday morning March 1, at 01.30, ending the Battle of the Sunda Strait. The loss of life was horrendous. Out of a crew of 1064, USS Houston lost 632 officers and men. 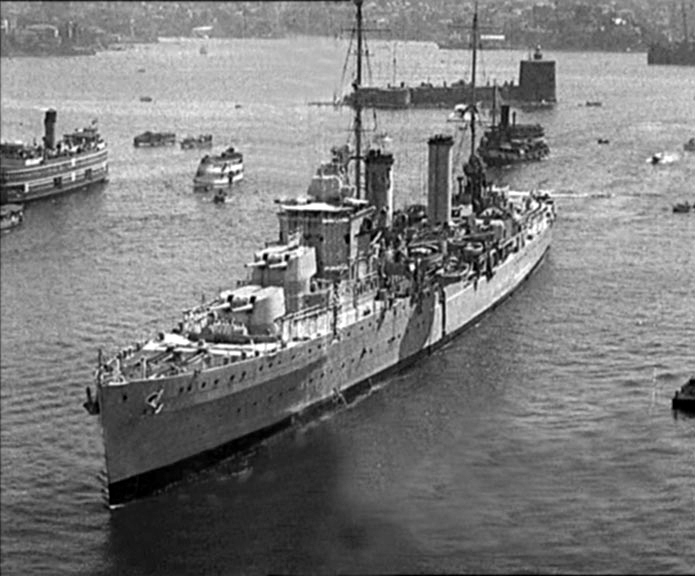 HMAS Perth lost 380 out of a crew of 680. Despite these setbacks the Western Japanese invasion force reached the beaches near Merak at 02.00. Their first detachments ran into Captain F.A.M. Harterink’s 12th KNIL Infantry Battalion. It briefly machine-gunned the invaders but was soon overwhelmed and wiped out by the Japanese troops. A full broadside of Japanese 12 inch shells. I think there were only cruisers there, so should be 8 inch. Thank you for noticing this – I will correct the text.